Colorful mantis shrimps and freshwater darter fish took the spotlight at the recent annual meeting of the Society for Integrative Biology (SICB) in Tampa, Florida. UMBC biological sciences Ph.D. candidates Ricky Patel, Alice Chou, and Natalie Roberts, who study these intriguing creatures, earned four of the top student prizes awarded at the meeting, bringing well-earned attention to their own research and UMBC’s strong graduate programs. Patel received the best student paper award for the Division of Neurobiology, Neuroethology, and Sensory Biology, and the best student oral presentation award from The Crustacean Society. Roberts was a finalist for the best student paper award for the Division of Animal Behavior. Chou received an honorable mention for the best student oral presentation from The Crustacean Society. Chou and Patel are studying mantis shrimp—small, colorful crustaceans that are “usually famous for two reasons: their very complex visual system and their very ballistic strike,” says Chou. Patel is figuring out how mantis shrimp navigate to and from holes they call home. His inventive project has shown that at any point in time, a mantis shrimp can measure the most direct path back to its starting location—a skill humans can’t claim. 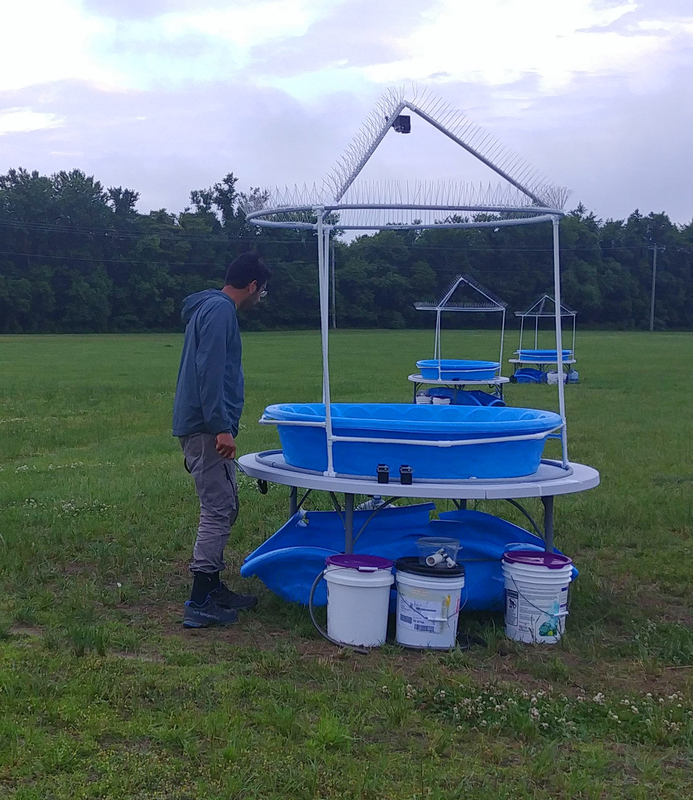 Ricky Patel checks on his “arenas,” the experimental setup he uses to study mantis shrimp navigation. Photo by Natalie Roberts. Chou is learning more about a region of the mantis shrimp brain called the central complex, which combines sensory information to help the animal decide what to do next. While much of the mantis shrimp changes drastically as it develops “from a weird little scrunchy larva to a big punching adult,” Chou recently discovered that one part of the central complex doesn’t change much at all. Now she’s asking why. Roberts studies freshwater fish called darters. It’s common for multiple darter species to live in the same area, leading evolutionary biologists like Tamra Mendelson, professor of biological sciences, to wonder how they prevent interbreeding. Scientists had long assumed that female choice was the dominant driver, but Roberts and other students in Mendelson’s lab have shown that males are “probably much more important than we anticipated” in preventing interbreeding, Roberts says. Chou and Patel both work closely with Tom Cronin, professor of biological sciences, and greatly value his approach to mentorship—encouraging them to take ownership over their work and pursue the questions that drive their passion for research. “My main philosophy is if graduate students are going to be successful career scientists, then they need to be able to work without a lot of direction,” Cronin says. 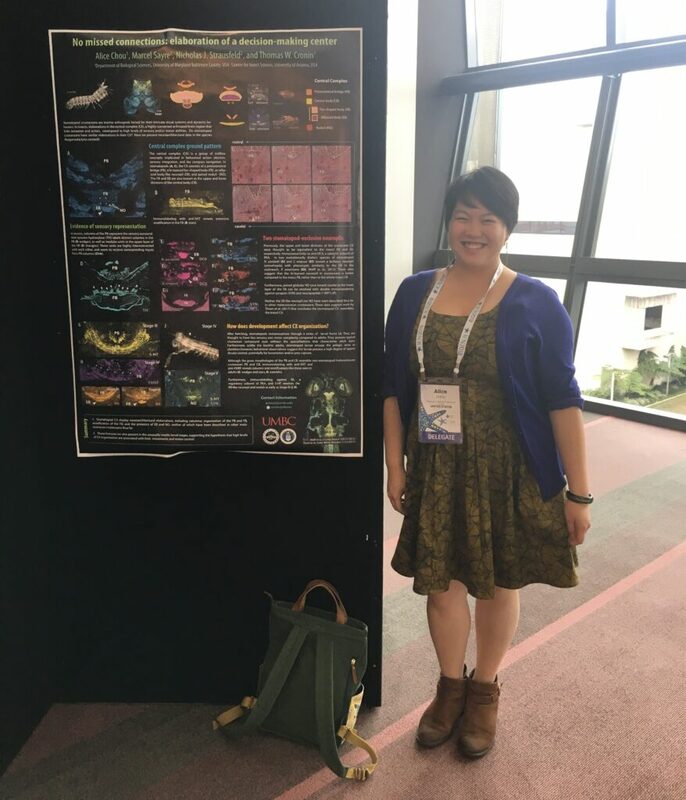 Alice Chou with her poster at the International Congress of Neuroethology in 2018. Photo by Taylor Rupp. Mendelson, too, works to ensure her graduate students leave her lab as confident and experienced independent researchers. “That’s my biggest goal,” she says. Roberts can vouch for that. “Tamra was really open to me trying techniques that she wasn’t as familiar with herself,” she says. And when Roberts has a gut feeling about which direction to take her work, Mendelson trusts her to run with it. “Her confidence in my skills and my intuition for what I’m doing has been really helpful,” Roberts reflects. Paired with that freedom is a level of support that helps Cronin and Mendelson’s students build compelling research projects and enhance their communication skills, which can lead to awards from big events like SICB. 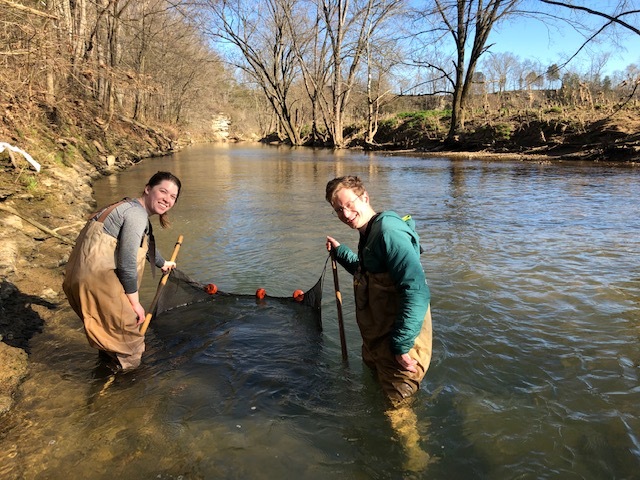 Natalie Roberts (left) and Sam Hulse collect fish for their research. Photo by Tamra Mendelson. “I feel like one of the reasons that we do well in the student competitions is that we have mentors who are giving us constructive feedback,” says Roberts. All three Ph.D. students expressed gratitude for the support they’ve received in preparing for presentations, from their first research talk to today. “I’m happy to sit down with them constantly,” says Cronin, whether it’s to talk about their research progress or help them sort out more personal challenges. Mendelson, too, is there for her students, in the classroom and in the field. When Roberts was struggling to collect fish for her experiments, “She and I together went out into the stream,” Roberts remembers. 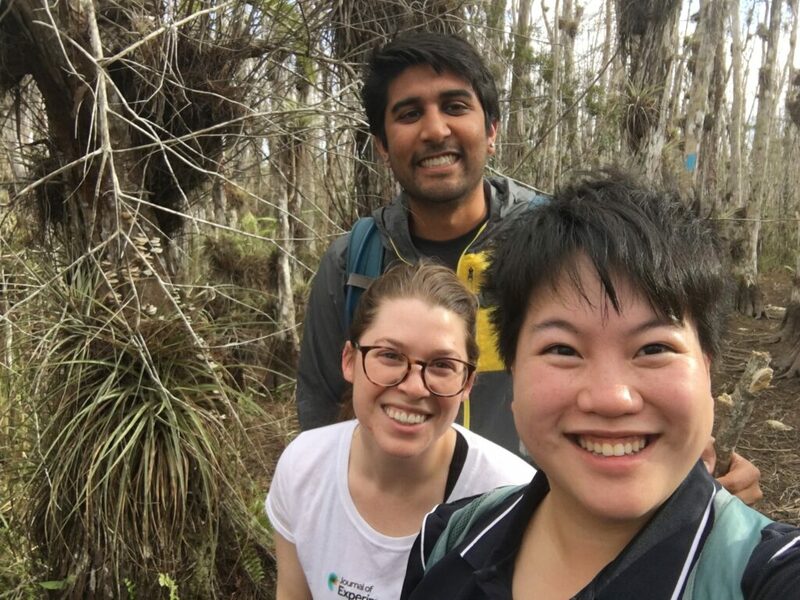 Ricky Patel, Natalie Roberts, and Alice Chou hike in a Florida cypress swamp after SICB 2019. Photo by Alice Chou. At SICB, says Chou, “You often see graduate students presenting their work right alongside high-flying lead investigators.” With the support they’ve received to pursue innovative research, and the recognition they’ve earned, Chou and her fellow Ph.D. candidates are already seeing themselves as that next generation of leaders. Banner image: A peacock mantis shrimp. Photo by Bernard Dupont, used under creative commons BY-SA 2.0 license.